← $1000 towards a Diamond! Have you seen the new styles of Le Vian jewelry that we just got in at Jewelry Warehouse? Le Vian is the internationally renowned fine jeweler with a storied past tied to historical jewels and ancient royalty and a trend setting present bejeweling hundreds of celebrities for Red Carpet appearances each year. Le Vian is the world’s leading innovator in fine jewelry, creating the hottest new design concepts and branding the Le Vianese flavors of diamonds, gemstones and metals. Discover the innovative looks and decadent designs from the preeminent forecaster of fine jewelry trends whose designs are regarded as works of art. Savor the extraordinary Le Vian Chocolatier® collections featuring Chocolate Diamonds®, Le Vian®’s international brand of natural fancy color brown diamonds. 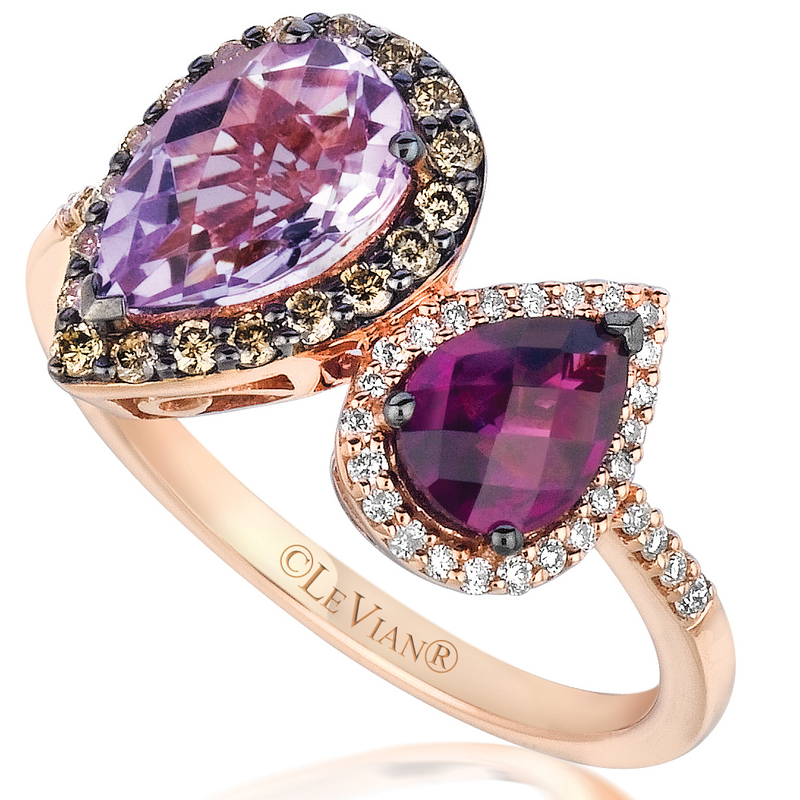 Le Vian® is the only company in the world to make jewelry with Chocolate Diamonds®. Discover the beauty and elegance in these amazing rings, necklaces, and earrings by Le Vian! Some Historical Information: Le Vian’s journey as America’s oldest jeweler spans 500 years. Some of their earliest designs were inspired by nature. In their early period, between 1500-1756, their jewelry emphasis was on workmanship, hand carving, hand painting, beading, engraving and enameling. Le Vian Jewelers have been purveyors of fine jewelry since the 15th century when the Nadir Shah of Persia conquered India and brought back the fabled Kohinoor diamond, the largest ruby ever discovered and other priceless gems. Who could be trusted to guard his treasures? The LeVian Family, whose ancestry dates back 2500 years to the priestly Levi tribe of ancient Israel. These pieces are amazing! Click on the thumbnails below to zoom in. See these pieces below, online here. This entry was posted in Diamonds, Jewelry and tagged diamond jewelry, diamonds, Jewelry, le vian, levian jewelry. Bookmark the permalink.